Fast Food. Junk Food. Snacks. I came across these FUN finds the other night. Don't you need a hot dog stapler in your life? ;) LOL I think everyone should own something that puts a SMILE on their face. 1. Anya Hindmarch Kit Kat Clutch 2. 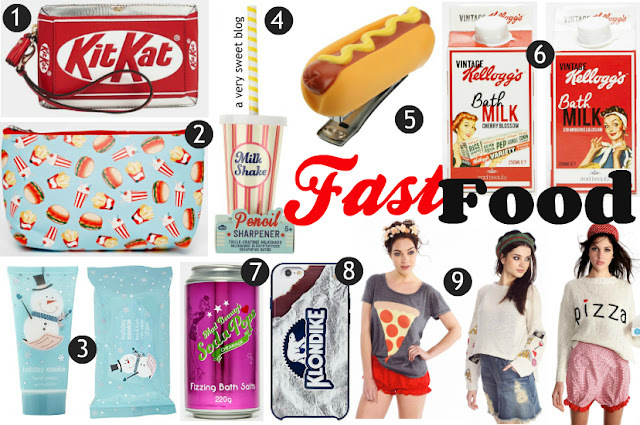 ASOS Fast Food Makeup Bag 3. ULTA Holiday Cookie Hand Cream & Mini Wet Wipes 4. Colette Milk Shake Pencil Sharpener 5. Colette Hot Dog Stapler 6. ASOS Kelloggs Vintage Milk Bath Duo 7. Mad Beauty Soda Pops Fizzing Bath Salts 8. Kate Spade Klondike iphone 6 case 9. Wildfox Hot Slice Tee, Vintage Emoji Dinner Party Sweater, Simply Pizza Dinner Party Sweater. i would so get the klondike bar, haha. so fun. even the hot dog stapler! great finds, kim! Love the kit kat to whimsical perfect. So cute Kim! Yes I absolutely need a hot dog stapler in my life! These all look so so amazing! So cute!! Where has that hot dog stapler been all my life ;p Leave it to you to come up with all these fun and adorable finds Kim! Who doesn't need a hotdog stapler in their life? These items are so fun, Kim! I'm personally eyeing the Klondike Bar cellphone case, so cute. Haha! These are some really good finds, Kim and guaranteed to put a smile on someone's face! I love the hotdog stapler, that would be perfect for my husband's office! so cute! Yup, who doesn't need a hot dog stapler :) I love Kit Kats, so I'm loving that clutch too. I know… these have caught my eye too ! The Ulta cookie hand creams are my favorite here for sure! haha...cute!! Love this and I agree...we should all have something that makes us smile! These are all so cute and kitschy1 I love things like this! the Kellogs milk baths look really interesting!! Those are so cute! You find the best things like this Kim!! I totally need that shirt with the huge pizza slice on it lol! The are so much fun! Definitely brought a smile to my face! Those retro looking milk containers look so cool! Should An Engagement Ring Be A Complete Surprise?